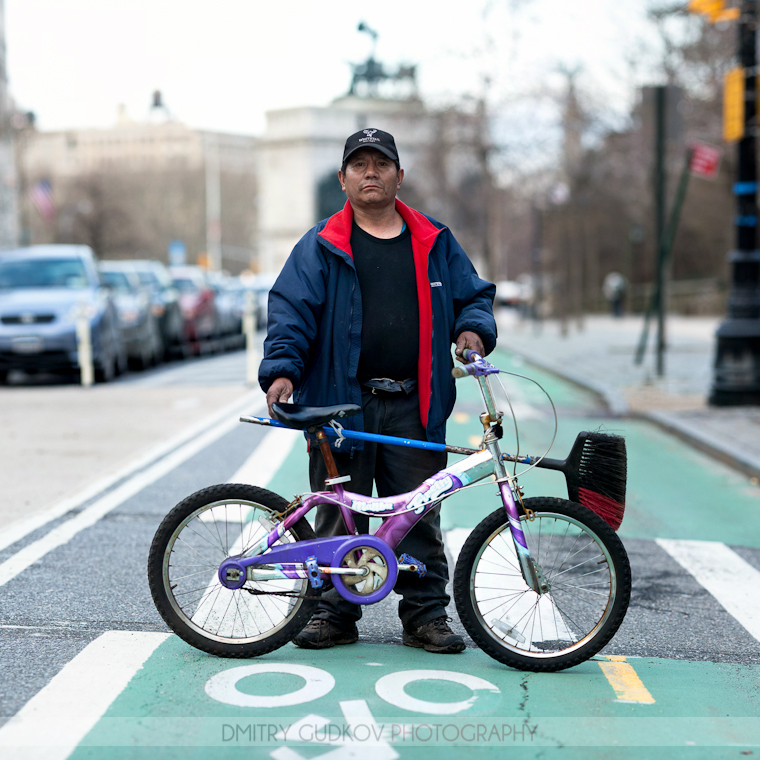 Artcrank profiles Dmitry Gudkov and his ongoing #BikeNYC project. Dmitry highlights the photo above as one of his most memorable, and I agree. One that I always think of is Isaac, whom I saw riding on the then-very controversial Prospect Park West bike lane. I asked him for a portrait, and he agreed. This was during the period when the bike haters were suing the city and decrying the lane for taking away a lane of car traffic to cater to “hipsters” who would just ride for fun in the park. And here is this working class guy, an office cleaner, riding home from work in the PPW bike lane on a rusty little girl’s bike with his broom tied to the frame. And he has such a dignified bearing. I feel like everything about him refutes the caricatures of the NIMBY anti-bike people and reminds us that we have a real interest in expanding good bike infrastructure in New York. Elsewhere in the profile, Dmitry gives one of the best descriptions of what it’s like to bike in New York City that I can recall. First and foremost, I would call it a liberating experience. It changes your relationship with the city. Getting around New York, you’re often held up waiting for a train or a bus. With a bike, you just hop on and go. It’s like discovering a cheat code to the city. I’d rather ride my bike 45 minutes to get somewhere than wait for a 20-minute subway ride. It makes you feel independent and self-reliant. Also, it’s fun! ← What’s Up with Prince Street? Dignified portrait indeed. I write about this often here in New Hampshire too. These men deserve proper infrastructure to get around and make a decent living with what they have.